This utterly surprised me by being an excellent movie. I daresay I’m not going to like Paprika half as much, even though Paprika‘s concept is pretty interesting too. But let’s leave comments on that for another time – like after I’ve actually watched it. 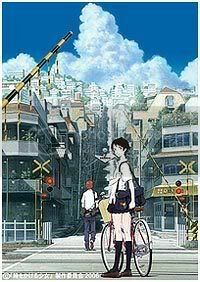 In a nutshell, Toki wo Kakeru Shoujo (henceforth Toki) is about a girl, Makoto, who becomes able to time-travel – literally leaping through time – and how she uses this ability of hers and learns the consequences of it. Animation is pretty fluid and excellent by anime standards. (I was in awe at the Van Gogh-esque, Impressionistic sequences when Makoto first leaps through time!) Character designs aren’t too bad; of course incomparable to character design in the US and Europe, but at least they’re not the type of anime characters where the only difference between characters’ features is hair style/colour and eye colour. Love the backgrounds – beautifully painted and detailed but they don’t distract you from the characters. The voices were cast pretty well. I’m relieved that the girl didn’t have the squeaky, high-pitched type of voice. Toki‘s storyline is simple enough, but I like the way it captures how a real person without any grandiose ambitions might actually use such an ability (e.g. going back in time to turn a bad day into a good one, avoiding uncomfortable circumstances) and how using that ability can have a negative impact on others, if not on the user. The character relationships – especially Makoto’s relationship with her close friends, Chiaki and Kousuke – are handled quite well too. All in all, I’d give this movie 4 or 5 stars – out of 5. Simple storyline, but not boring. An interesting twist and an ending that leaves you with a smile on your face. Check out aibo’s review if you like. Dug up the trailer on Youtube as well.